Submitted by Alan Champ on 18 January 2007 - 1:30pm. 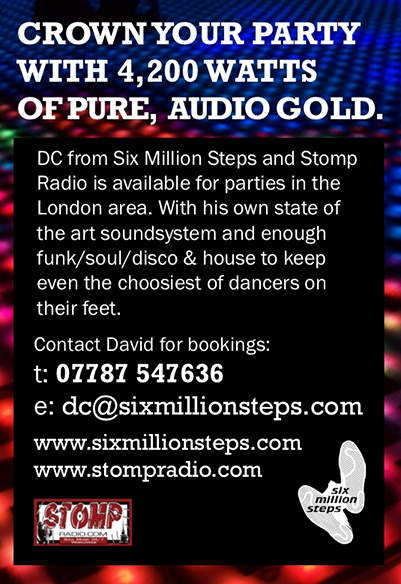 Exclusively mixed for Six Million Steps by Scottish disco supremo Al Kent. Al's other work can be checked out at his excellent Million Dollar Disco website. Submitted by SoipseClinips on 24 November 2009 - 1:22pm. Playing in Brum again soon? Submitted by shuggie61 on 18 August 2007 - 3:35pm. Submitted by David Cooper on 20 August 2007 - 11:32am. Submitted by soulie on 2 November 2007 - 10:20am. loved the mix,but also loved another mix Mr Kent did for his own site, million dollar etc,by the name of "al kent's newies" i've e-mailed him at the above but with no response regarding the track listing,if you see him please ash him to pass on or post one. Six Million Steps is the best site about ,thank you for making available great music free, if you had to, or could buy some of these rerities would cost a fortune,keep up the great work. Submitted by Mark A on 5 November 2007 - 12:42pm. I can't remember any occassion where Al has posted up a tracklist for his mixes on MDD. It's best to check out the forum and see if any tracks are i.d. in a relevant thread. I'll have another listen to the mix soon and jot doen what i know for you. Submitted by soulie on 6 November 2007 - 10:19am.